^ "His philosophy, so far as he adopted a system, was the stoical, but it was rather an eclecticism of stoicism than pure stoicism" Long, George (1870). "Seneca, L. Annaeus". In Smith, William (ed.). Dictionary of Greek and Roman Biography and Mythology. 3. p. 782. ^ Gioia, Dana (1992). "Introduction". In Slavitt, David R. (ed.). Seneca: The Tragedies. JHU Press. p. xviii. Vogt, Katja. "Seneca". In Zalta, Edward N. (ed.). Stanford Encyclopedia of Philosophy. "This correspondence was probably forged in the fourth century, either to recommend Seneca to Christian readers or to recommend Christianity to students of Seneca." "As they are now universally allowed to be spurious, it will be unnecessary to state at length the grounds of their condemnation. It is sufficient to say that the letters are inane and unworthy throughout; that the style of either correspondent is unlike his genuine writings; that the relations between the two, as there represented, are highly improbable; and lastly, that the chronological notices (which however are absent in some important MSS) are wrong in almost every instance. Thus, independently of the unbroken silence of three centuries and a half about this correspondence, internal evidence alone is sufficient to condemn them hopelessly." For the Latin song, see the article "De Brevitate Vitae".De Brevitate Vitae (English: On the Shortness of Life) is a moral essay written by Seneca the Younger, a Roman Stoic philosopher, sometime around the year 49 AD, to his father-in-law Paulinus. The philosopher brings up many Stoic principles on the nature of time, namely that people waste much of it in meaningless pursuits. According to the essay, nature gives people enough time to do what is really important and the individual must allot it properly. In general, time is best used by living in the present moment in pursuit of the intentional, purposeful life. De Clementia (frequently translated as On Mercy in English) is a two volume (incomplete) hortatory essay written in 55–56 CE by Seneca the Younger, a Roman Stoic philosopher, to the emperor Nero in the first five years of his reign. De Constantia Sapientis (English: On the Firmness of the Wise) is a moral essay written by Seneca the Younger, a Roman Stoic philosopher, sometime around 55 AD. The work celebrates the imperturbility of the ideal Stoic sage, who with an inner firmness, is strengthened by injury and adversity. De Otio (On Leisure) is a 1st-century Latin work by Seneca (4 BC–65 AD). It survives in a fragmentary state. The work concerns the rational use of spare time, whereby one can still actively aid humankind by engaging in wider questions about nature and the universe. De Providentia ("On Providence") is a short essay in the form of a dialogue in six brief sections, written by the Latin philosopher Seneca (died AD 65) in the last years of his life. He chose the dialogue form (as in the well-known Plato's works) to deal with the problem of the co-existence of the Stoic design of providence with the evil in the world. 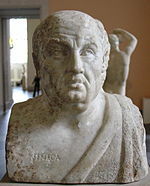 De Tranquillitate Animi (On the tranquility of the mind) is a Latin work by the Stoic philosopher Seneca (4 BC–65 AD). The dialogue concerns the state of mind of Seneca's friend Annaeus Serenus, and how to cure Serenus of anxiety, worry and disgust with life. The Epistulae Morales ad Lucilium (Latin for "Moral Letters to Lucilius"), also known as the Moral Epistles and Letters from a Stoic, is a collection of 124 letters that Seneca the Younger wrote at the end of his life, during his retirement, after he had worked for the Emperor Nero for more than ten years. They are addressed to Lucilius, the then procurator of Sicily, who is known only through Seneca's writings. Regardless of how Seneca and Lucilius actually corresponded, it is clear that Seneca crafted the letters with a broad readership in mind. The letters often begin with an observation on daily life, and then proceed to an issue or principle abstracted from that observation. The result is like a diary, or handbook of philosophical meditations. The letters focus on many traditional themes of Stoic philosophy such as the contempt of death, the stout-heartedness of the sage, and virtue as the supreme good. Hercules or Hercules furens (The Mad Hercules) is a fabula crepidata (Roman tragedy with Greek subject) of c. 1344 lines of verse written by Lucius Annaeus Seneca. Hercules Oetaeus (Hercules on Mount Oeta) is a fabula crepidata (Roman tragedy with Greek subject) of c. 1996 lines of verse which survived as one of Lucius Annaeus Seneca's tragedies. It tells the story of Hercules' betrayal by his jealous wife, Deianira, followed by his death and apotheosis. The general opinion is that the play is not Seneca's, but was written in close imitation. Mio figlio Nerone (literally: My Son Nero), released in the US as Nero's Mistress is a 1956 Italian historical comedy film directed by Steno and starring Alberto Sordi, Vittorio De Sica, Gloria Swanson and Brigitte Bardot, with cinematography by Mario Bava. It depicts a visit by the Roman Emperor Nero and his entourage to a coastal villa. The movie was released in Italy in September 1956 and in France in October 1957. The US dub, released in 1962, was recut to a substantially different film, shifting the emphasis from Agrippina to Poppaea (as the title reflects). Seneca's Consolations refers to Seneca’s three Consolatory works, De Consolatione ad Marciam, De Consolatione ad Polybium, De Consolatione ad Helviam, written around 40–45 AD. The Death of Seneca is a 1773 painting by Jacques-Louis David, now at the Petit Palais in Paris. It shows the suicide of Seneca the Younger. With its Boucher-like assembly of gesticulating figures, it was his third attempt to win the Prix de Rome, but lost to a painting on the same subject by Pierre Peyron. Peyron's had fewer details and a darker colour palette and was closer to the 'antique' - he was not only David's rival, but also initiated the new classicism which partly inspired David to produce his 1774 Erasistratus Discovering the Cause of Antiochus' Disease.